A while back I had heard that the creators of Penny Arcade were stopping by St. Louis to chat with us, I thought it was a perfect opportunity for the Supper Club to try a new restaurant and check out the talk. Shh, don’t tell anyone, but we’re secretly geeky (who am I kidding, it’s not that much of a secret). Okay, everyone absolutely raved about their own dishes. I had the grilled-cheese sandwich and it was excellent with the tomato and basil pesto. Just the right amount of melted cheese that it didn’t string too much when eaten. I had a bite of the fish tacos and they were very flavorful and tasted so fresh. The breading-crabmeat ratio was perfect for the crabcakes and the salmon was cooked perfectly. I was also a fan of the sweet potato chips that came with my meal. Some were a bit overcooked but the rest were great. If you’re out and about in South City and it’s beautiful weather, head on to the Royale for some enjoyable food and laid-back atmosphere. After dinner, we headed over to Mad Art Gallery to catch the end of the talk. When we got there, the Penny Arcade guys were taking questions. 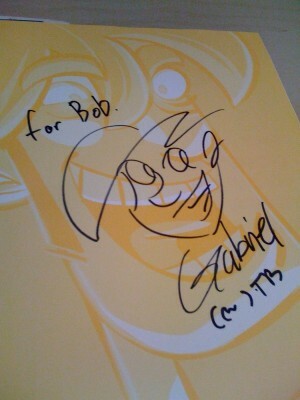 The illustrator, Mike Krahulik, had a PC tablet projected on a screen and while Jerry Holkins talked, he would be drawing anything from Gabe and Tyco to penises. Since I only knew about half of what they were talking about, I was very entertained by the drawings that Mike quickly threw out. I’ll be honest, I thought that it wouldn’t be very crowded but I was very surprised to see the entire gallery packed like sardines. I mean, when we walked in, I was reeled back by the intense amount of body heat from the room. There were more geeks than I thought that resided in St. Louis. I do have to say, Bob was probably one of the most well-dressed and “coolest” guys there (and that’s really not saying much, so you can imagine who attended). How cool are these autographs? Great weather, great good, great experience. This entry was posted in Art, Friends, Our Boring Lives, Restaurants, Supper Club by Jen. Bookmark the permalink.